Now, it’s your turn to have a say! The final public open houses for the plan will take place on Monday, November 13 (New Orleans Public Library) and Tuesday, November 14 (Kenner Senior Center). What’s good in the draft plan? One of the biggest complaints of New Orleans transit riders is that the bus takes too long to get to where they are and too long to get to where they’re going. This plan attacks that head-on with an outline of a high frequency network stretching into New Orleans East, the West Bank, AND across the Orleans/Jefferson Parish line. It also proposes a secondary “Select” network, that would see frequency levels every 10 to 15 minutes during peak period. The best way to track overall progress in the coming years is through strong benchmarks to gauge progress. The draft plan provides some good ones. The most important is a target that ties RTA performance to increasing access to jobs. Currently the average New Orleanian can only reach 33 percent of the region’s jobs in 60 minutes or less – the plan calls to increase that to 60 percent in the next 10 years. The most difficult part right now for transit riders pushing for change is that there is no framework to refer to hold the RTA accountable. With a detailed series of action items that are well-organized by strategies and goals, this plan changes that. 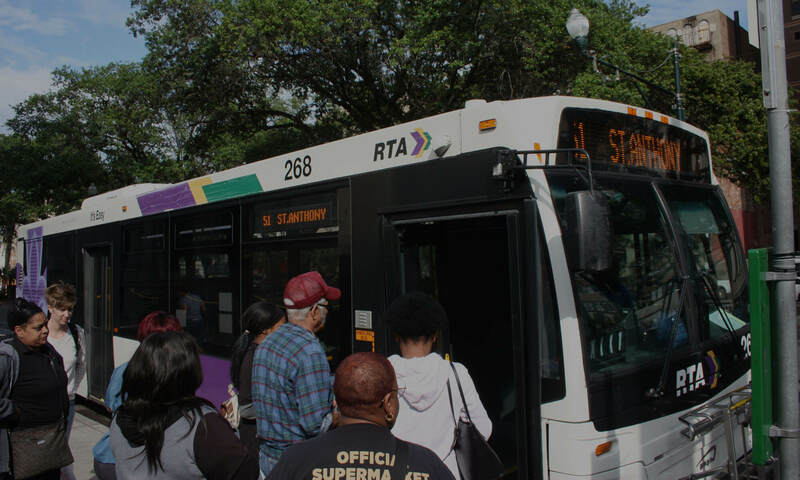 This won’t turn around transit overnight for New Orleans riders, but it will be an important tool to win a steady stream of improvements in the coming years. What’s needs to be better? The RTA rightfully identifies improved CBD mobility as a priority but only proposes a downtown streetcar loop and expanded St. Claude streetcar line as a solution. Those are expensive proposals that could take away funding from other needed priorities. And since we currently don’t include important features like dedicated lanes, they likely won’t help riders get to job opportunities any faster. We need your help to make sure this idea doesn’t move forward – at least before real proof that it will help. There are a lot of good ideas in the draft plan. But there are a lot of blanks that still need to be filled in. We’d especially like to see more details on short-term progress toward the high frequency corridors and “Select” lines. The plan also calls for more studies on the high frequency corridors and a network redesign – we need the next steps explicitly stated so there’s no unneeded delays. The RTA has only given a big picture cost estimate. If everything proposed was implemented over the next twenty years, operating costs would basically double. While that’s important, we also need to understand what the costs for individual pieces and phases of the plan are. That can help RTA riders understand what is practical in the short-term without increased revenue. It can also help to better prioritize projects over the next decade and beyond. Finally, it can jumpstart a conversation on whether additional revenue is needed and how we can achieve that. For more details, you can see the full draft plan. If you’re not able to make it to next week’s public meetings, but still want to comment, you can send your comments directly to the RTA at StrategicPlan@norta.com. Please remember to CC us at info@rideneworleans.org!